Aspendos, which is home to one of the few antique theaters that has survived until today in Antalya, has been challenging the centuries. Located in the Serik district of tourism's capital Antalya, the theater is one of the most visited historical ruins by both local and foreign tourists in Antalya. The ancient city, which includes the ancient theater with its seating areas and stage, stands out with its 1-kilometer long aqueduct. The 2,000-year-old two-floor shops and stoa (columned gallery) complex revealed after months of excavations indicate the importance of the city in terms of commerce and politics. The head of Aspendos Ancient City Excavations and Hacettepe University Department of Archaeology Member associate doctor Veli Köse told Anadolu Agency (AA) that even if the city was located 12 kilometers from the shore, it was a port city. He stated that this had provided political and commercial advantages to the city. Explaining that excavations have been ongoing since 2008, Köse said the first surface surveys were carried out and they started excavations under the leadership of Antalya Museum after 2012. Since 2014, excavations were carried out with the permission of the Council of Ministers. The head of the excavations added that the excavations revealed that the history of the city, which was once thought to date back to the 5th century B.C., actually dates back to the 10th century B.C. There were ceramics and figurines (terracotta figurines) were discovered with the excavations. Köse noted that these findings were very important in terms of the history of the region. Stating the importance of the stoa and the 2,000-year-old shops discovered during the excavations, Köse said, "We are continuing to excavate the area where the shops and stoa complex are located this year. We are currently carrying out excavations on the street which we believe runs around the circumference of the two floor shops and stoa complex. The shops are made up of two floor rooms that seem to have come out of a template. There is another line of rooms behind the shops. We believe these rooms may be used as offices or sales venues. The excavations show that these shops have been used for 300-350 years. With the progress of excavations in the complex, we will be able to say more about the first use of these shops." Aspendos was one of the most important cities in the Pamphylia region and Köse said that it also has a multi-floor Hellenistic structure that was used as a market building. "Whichever products were produced and stored, the Hellenistic period was a rich period. These structures prove the commercial and political richness of the city. At the same time, the ceramics we discovered differ from each other. This proves the constant economy in the city," added Köse. Köse said the reason Aspendos was so well preserved until today is the building structure, which is rare in Anatolia. Because the theater was built as a whole with its cavea (seating areas) and the stage building, it has been preserved until today. 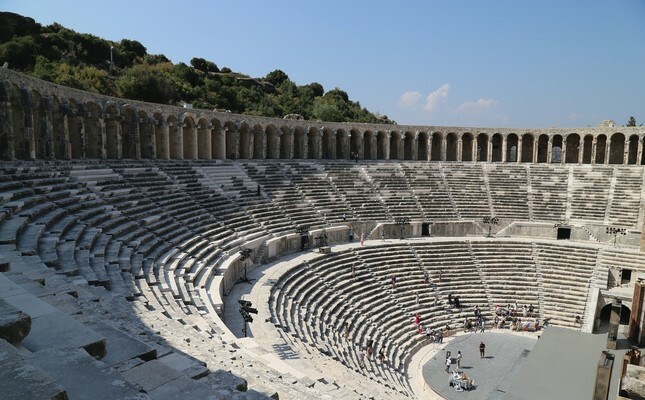 "Aspendos Theater is a product of Roman architecture. Another factor why it survived until today is because it was used by the Seljukians. The north and south towers of the stage building were restored by Kayqubad I. The plaster on the towers and outer areas and the red zig-zag paints were left from the Seljukians. The importance of the theater increased because the stage building is so well preserved," he said. The aqueducts are more important than the ancient theater for archaeologists since there are so few examples left today – especially because of its length. Köse further expressed the importance of two siphons of the aqueducts, which survived until today. The siphons pumped the water coming from a distance of about 25 kilometers and distributed it throughout the city, he explained. "A real engineering wonder," Köse concluded.